My story earlier in the month, Fakebook, Fake Event, Fake Story pertains to the lame and desperate attempt to inflate the claim of Russian involvement in American elections – at least that’s what I thought when I read the article about it in our local newsrag. It seemed absurd that Twin Falls, ID was brought into the story because of a Facebook post of an event that was not organized by the people in Twin Falls. It was organized by a group called SecuredBorder. I have a vague recollection of the post but at the time I asked another local activist if she knew who was sponsoring the event. She didn’t. I’m about 99.9% sure I didn’t sign up for it because I didn’t know who they were but regardless, I didn’t go and I forgot all about it until the article in the Times-News. Since the article (Exclusive: Russia Used Facebook Events to Organize Anti-immigrant Rallies on U.S. Soil) in the Daily Beast claiming that the Facebook event was connected with Russian interference into American politics was published, there have been so many programs of various types on C-Span on the subject of the Russians it’s been hard to keep up. It’s almost like they are trying to do a “do-over” of the Russian Hack narrative but without the hack and the connection to the DNC. The media is attempting to connect the Facebook posts to some Russian company and the mainstream media is trying to link that to Donald Trump because of his positions on borders, immigration and refugees (from select countries). It’s a convoluted story that has a lot of air pockets in it – meaning that there are no clear connections only speculation and guilt by association with Paul Manafort who was an international election consultant and who did have connections to – not Russia but the Ukraine and the pro-Russian regime in the Ukraine. Since this is a hairball story, I’m just going to tell you what is the more likely story on the Facebook post with the fake event in Twin Falls – and this is my opinion for the record. I think the Facebook post for the fake event in Twin Falls was probably placed by the Southern Poverty Law Center through a proxy. If the other stories are correct that the company that placed the facebook post was Russian, then that would be a Russian proxy. There are SPLC people crawling all over the west looking to demonize people who opposed refugee resettlement and the globalist agenda of open borders. I suspect (with good reason) that they are members of Moveon. Moveon is an extremely large group of networked liberals that were funded in large part by George Soros. I don’t know if they are today because I haven’t kept up with them but they were when I first found them. In late 2014 and early 2015, I wrote a series of articles about the refugee resettlement SYSTEM. Following that, a group formed in Twin Falls to oppose the refugee resettlement operation at the College of Southern Idaho (CSI). CSI is a community college in Twin. Another group formed around the same time connected with ACT for America – Bridgett Gabriel’s group. There was another group called Idaho III%. They sponsored a couple of marches protesting refugee resettlement. All the groups participated in those marches. The second march in Boise captured the attention of the SPLC because there was an SPLC reporter on scene. I know he was with the SPLC because I talked to him. The SPLC story was picked up by Raw Story and Drudge picked it up so I wrote a response to it. Doing this kind of dirty trick is right up the alley of the SPLC. They demonize and destroy people because it’s good for fundraising and it’s good for their communist cause to target real American patriots. The dangerous part of it is that they are connected to Homescam Security’s STASI network. In 2010, it was revealed that the Missouri fusion center was using the SPLC as a source for identifying “right wing militia and hate groups” when the MIAC Report was leaked. MIAC stands for Missouri Information and Analysis Center. Fusion centers are Homescam Security’s information collection and dissemination centers supposedly for information on terrorists. The reason I believe that SPLC placed the fake Facebook ad is obvious from what I said above. The reason I think they did it through a proxy is because it’s been reported recently – even by the Daily Kos that SPLC has offshore bank accounts and investments in foreign companies. They have been transferring millions offshore to the Cayman’s, British Virgin Islands and Bermuda. If this offshore’d money comes back into this country as Foreign Direct Investment in an EB-5 center or as a recruited company through the international/national economic development system, they can start a domestic business completely subsidized by the U.S. taxpayers. It’s an incredible scam that is too complicated to describe here – but just do your home work on economic development and you’ll find it. The scam operates in both directions – money out and money in – and it involves corruption of local officials – but probably also up to the national level as well in both of the target countries. 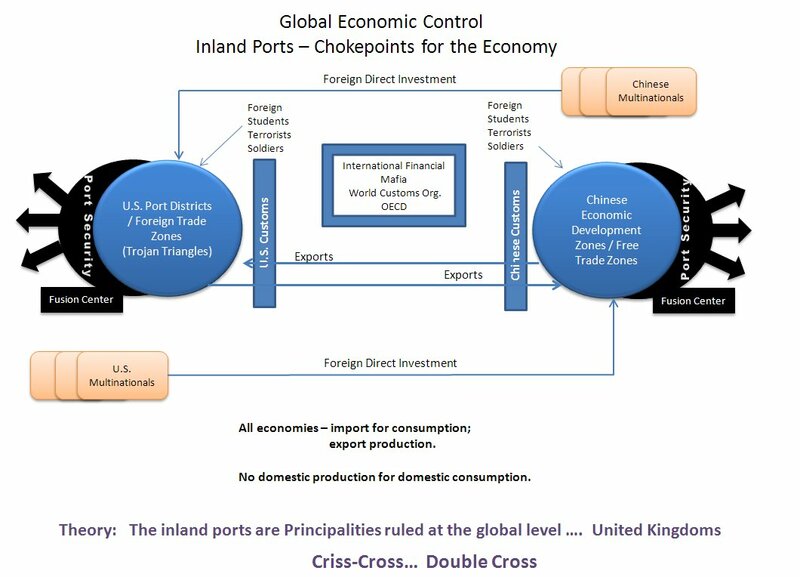 When I was researching it – putting together the pieces by looking at what was happening in Meridian, Idaho, I called it a “criss-cross double cross“. Nobody in U.S. officialdom wants to investigate it probably because a lot of them are involved in it. The Patriot Conspiracy Note: I found the article on the New America website but they didn’t include the .pdf on the file so I couldn’t link to it.